No compensation was received for this post. The manufacturer provided the coupons for the giveaway. All opinions expressed are my own or that of my family. A few months ago, on a week where my husband was doing the grocery shopping, he came home with a new product that he had tried and a few coupons from the demo stand. The product was Qrunch burgers. As recently as a year ago, I would have been surprised that he had bought some, but lately he seems to be more open to new foods. We don't have any dietary restrictions or try to eat a certain way, other than just an overall balanced, healthy diet with reasonable portions (at least most of the time). 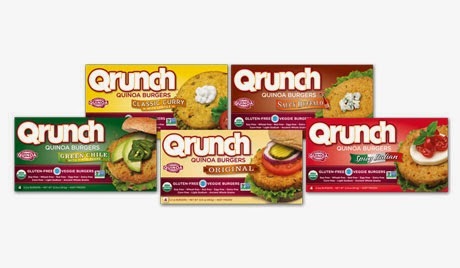 Qrunch burgers are made with Quinoa and other vegetables/beans depending on the variety. The products are Gluten-free, Soy-free, Wheat-free, Nut-free, Egg-free, Dairy-free, Corn-free, Animal-free, Light Sodium and use Ancient Grains (Quinoa). Looking at a list like that might make you wonder about the flavor, which by the way is great. Not only are they flavorful, they have a nice crunch when prepared too. The product is so easy to prepare. You can make them in your toaster. Put it through two cycles in your standard toaster and your Qrunch burger is ready to eat. We eat them like a burger, placing them on a bun and topping with tomatoes, lettuce, mustard, ketchup, etc. There are five varieties of Qrunch burgers - Original, Spicy Italian, Green Chile, Sweet Curry and a new one that I am going to have to find - Saucy Buffalo. We have tried the first four flavors. The family favorite is the Spicy Italian, but my husband also likes the Original and the Green Chile. I am sure that when we find Saucy Buffalo, that will be a favorite too. At just about 200 calories per Qrunch burger, varies slightly by variety, we find that they fit well in our diet. Have you tried Qrunch burgers? What did you think? Courtesy of Qrunch Foods, I have several $1.00 off coupons that I can giveaway to A Busy Mom of Two readers. The coupons are good through the end of the year. Giveaway will remain open through December 1st. Winners will be selected through Rafflecopter. The winner will have 24 hours to respond or a new winner will be selected. Coupons are only good until 12/31/14 and will be mailed to the winners. A Busy Mom of Two is not responsible for lost or misdirected mail. Love trying new products, this sounds like a tasty lunch. For me I think the Spicy Italian! I'd go with the original first! I'd like to try Spicy Italian first. I'd like to try the original burger! First I'd try the Spice Italian Burger variety. I would try the green Chile first. I think Green Chile would be my first choice! CONNIE SOWARDS commenting: I've never tried these. I'd like to try the Original first then maybe the Saucy Buffalo. I would try the low sodium first.